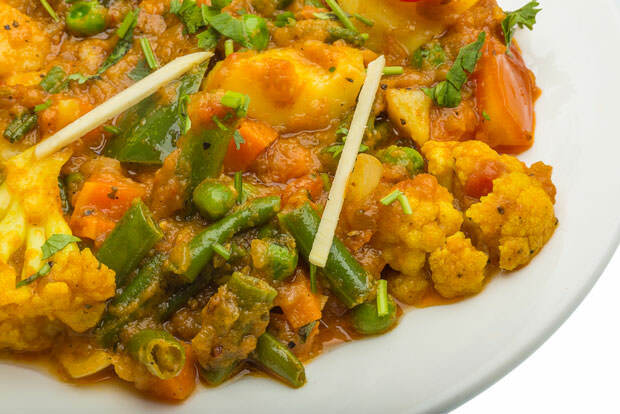 If you’re looking for a healthy, exotic dish to add to your vegetarian diet, this Indian recipe is just what you need. It’s rich in flavor, mildly spicy and really easy to prepare. Dice the onion, mince the garlic cloves, slice the potatoes and carrots into cubes, slice the jalapeno pepper, and chop the green and red bell peppers. Heat the vegetable oil in a skillet over medium heat. Place onion in skillet and cook until tender. Add ginger and garlic, cook for 1 minute. Add potatoes, carrots, jalapeno, cashews, and tomato sauce. Season with salt and curry powder. Cook until the potatoes are tender, which shouldn’t take longer than 10 minutes. Stir while cooking. Add peas, green and red bell peppers, and cream. Reduce heat to low, cover and simmer for 10 minutes. Add cilantro before serving.